Plant of the month. May 2015 LILAC FAMILY – Glacier View Landscape and Design, Inc.
May is here and the Lilacs are in bloom. Such great fragrances! Originating in the European Balkan countries, they were transported along the Silk Road to Istanbul, then to Paris, and were then transplanted in many European gardens. Lilacs have been a staple of the American landscape for centuries, having been brought by settlers in the 1700’s in their handbags. They readily adapted to our climate and migrated from east to west as the settlers moved. They are admired for their dependability, drought tolerance, fragrance, adaptability, and ease of care. The Common Lilac (Syringa vulgaris), shown in the pictures here are originally purple to lavender, the word Lilac coming from the Persian word meaning ‘bluish’. They are now available in this century in white, purple, lavender, pink, and a shade very close to red. One could write a dissertation on the history, cultivation, propagation, biology, and diversity of the species. This is meant only as an informative snipit on their history, care and feeding! A single bloom species, the Lilac must only be pruned right after the flowers have wilted in June, or one runs the risk of pruning off the next years blooms which will set by late summer or early fall. However, now botanists have cultivated what is called the re-blooming Lilac. 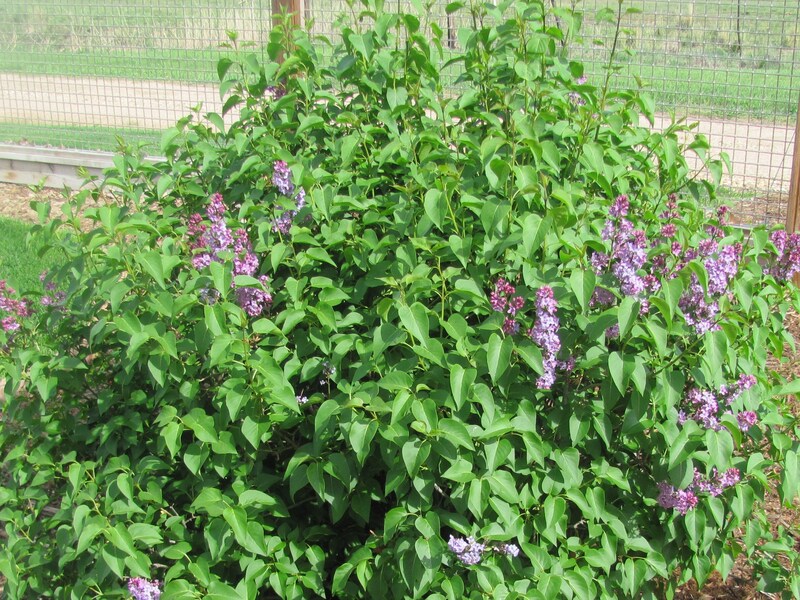 Small clusters of fragrant, flowers of lilac-purple occur in late spring, and may rebloom from mid-summer to frost. Deadheading of spent blooms may encourage repeat blooming. The rebloomers only get 4-5’ tall whereas the species can get to 20’. Note the 6’ fence next to the 45 year old specimen in the picture. And, between 1876 and 1927, the nurseryman Victor Lemoine of Nancy introduced over 153 named cultivars, many of which are considered classics and still in commerce today. Lemoine’s “French lilacs” extended the limited color range to include deeper, more saturated hues, and they also introduced double-flowered “sports”. 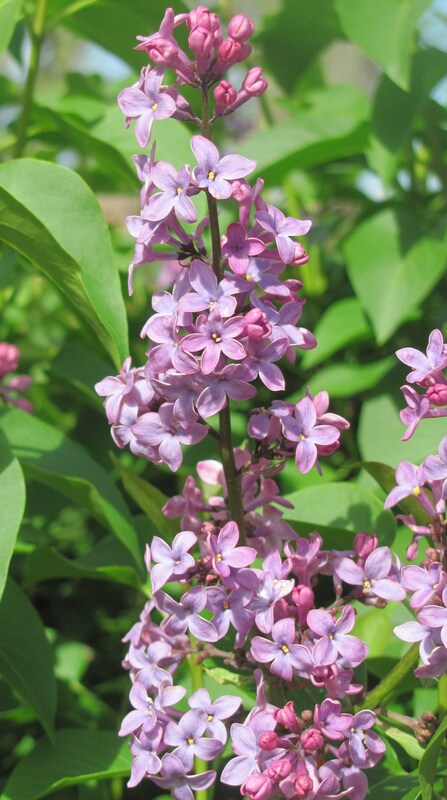 Lilacs are represented by 13 species of Syringa, the most common for Boulder County Colorado landscapes being Syringa vulgaris described above, prestoniae, hyacinthiflora, chinensis, reticulata which is a tree form getting up to 36’ tall, pekinensis, patula, and mayeri. Mayeri and Patula are the Dwarf Korean and Miss Kim varieties as they are commonly called and are smaller, getting only 3-6’ high and wide with much smaller and narrower leaf structures. They are often planted in subdivision type landscapes because of their size, the other varieties being too large when full grown for most subdivision sized properties, a mistake novices often make when planting. All lilac flowers are all similar in appearance from a distance, with distinct differences upon close examination. They are easy to grow, needing only moderate water to establish. They can survive drought well, keeping their leaves but wilting under heavy stress, only to perk up again with a good drink. They are easily transplanted, and if severely overgrown and neglected, can be heavily pruned back, taking only 2-3 seasons to regain a healthy appearance as a smaller shrub again. They are great as screenings, windbreaks, and as single specimens, but can easily be over used in the landscape if care is not taken for correct placement due to their size. Sometimes considered a little boring for their quick blooming, they can still hold a place in any landscape if planted with other complimentary shrubs and perennials that bloom when the Lilac is not. Plant a few in the right place in your garden for a springtime splash of color and fragrance!